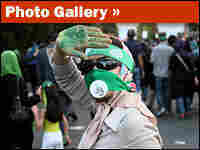 Expert: Iran Protests Full Of Symbolism Iranian presidential candidate Mir Hossein Mousavi joined a massive crowd of his supporters Thursday on the streets of the capital, Tehran. Shahram Kholdi, a teaching fellow at the University of Manchester, in England, offers his insight on the political unrest in Iran. 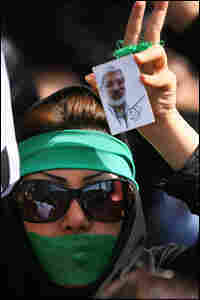 Iranian presidential candidate Mir Hossein Mousavi joined a massive crowd of his supporters Thursday on the streets of the capital, Tehran. Shahram Kholdi, a teaching fellow at the University of Manchester, in England, says the protests against last week's presidential election have been replete with symbolism. "It has been a very symbolic protest from the beginning," he says. "And when, just two days ago, Mousavi invited his supporters to demonstrate between Inqilab (Revolution) Square to Azadi (Freedom) Square, I think that was when symbolism really reached unexpected heights. ... I think Mousavi proved that he is the master of image and metaphor." Hundreds of thousands of anti-government protesters poured into the streets in Tehran on Thursday, nearly a week after a disputed election returned President Mahmoud Ahmadinejad to power in what officials said was a landslide victory over his reformist rival. Witnesses said opposition leader Mir Hossein Mousavi joined black-clad supporters in Imam Khomenei Square in the heart of the capital, both to protest Friday's election — which they believe was rigged — and to mourn the deaths of several demonstrators killed earlier in the week by pro-government militamen. Demonstrators marched silently until they arrived at the square, where some chanted "Death to the Dictator!" and "Where are our votes!" Press TV, an English-language version of Iranian state television, estimated the crowd size at hundreds of thousands and said there was a brief address from Mousavi, who called for calm and self-restraint. Thursday's march defies Iran's Supreme Leader Ayatollah Ali Khamenei, who issued an order against such assemblies, and comes amid reports that several opposition leaders and politicians have been arrested in a government crackdown. In an apparent effort to distance himself from criticism, Ahmadinejad released a recorded message on state television in which he said his earlier remarks comparing protesters to angry soccer fans were directed only at "those who made riot, set fires and attacked people." "Every single Iranian is valuable. The government is at everyone's service. We like everyone," he said. Hours before the protest, state radio reported that Iran's powerful Guardian Council said it will invite Mousavi and two other candidates in the presidential election to hear complaints of election fraud. A spokesman for the Guardian Council — a 12-member body of unelected clerics who wield veto power over legislative decisions — told state radio that the meeting with Mousavi, pro-reform cleric Mehdi Karroubi and conservative Mohsen Rezai would take place Saturday. The spokesman said the council had already begun examining a total of 646 complaints submitted in connection with the June 12 vote, which official results showed Ahmadinejad won. Iran's main electoral authority had agreed earlier to conduct a limited recount of ballots at sites where candidates claim irregularities. The recount would be overseen by the Guardian Council. Mousavi alleges that the council, which is close to Khamenei, is not objective and that it has already indicated support for Ahmadinejad. Mousavi has called for an independent investigation. On Monday, hundreds of thousands of opposition demonstrators turned out for a procession that recalled the scale of protests during the 1979 Islamic Revolution. Monday's procession ended in violence when seven people were shot by pro-government militia. Two days later, thousands marched silently down a main street in the capital, with amateur video showing people holding posters of Mousavi and signaling "V" for victory. Authorities have rounded up perceived dissidents and tried to further muzzle Web sites and other networks used by opposition backers to share information and transmit news of the crisis after foreign journalists were banned from reporting in the streets. The country's most powerful military force, the Revolutionary Guard, has said Iranian Web sites and bloggers must remove materials that "create tension" or face legal action. The government has blocked certain Web sites, such as BBC Farsi, Facebook, Twitter and several pro-Mousavi sites that are vital conduits for Iranians to tell the world about protests and violence. Many other sites, including Gmail and Yahoo, were unusually slow and rarely connected. 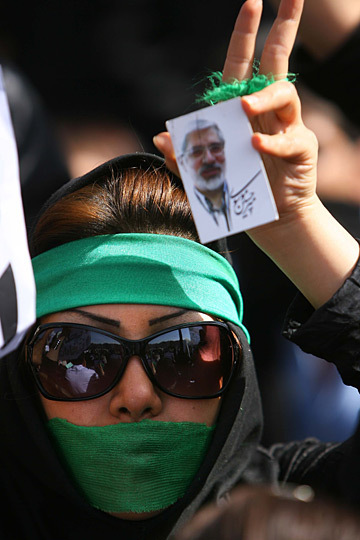 Mousavi has condemned the blocking of Web sites, saying the government did not tolerate the voice of the opposition. The Iranian government accused the United States on Wednesday of meddling in the deepening crisis. State media blamed Washington for "intolerable" interference, and state radio reported Thursday that "despite wide coverage of unrest, foreign media have not been able to provide any evidence on a single violation in the election process." President Obama said he shared the world's "deep concerns" but it was "not productive, given the history of U.S.-Iranian relations, to be seen as meddling." The two countries have not had formal diplomatic relations for three decades.